The South Devon Railway has decided that it will offer 2-8-0 No 3803 for sale by tender. The intention is to use the funds so raised to purchase motive power more suited to the line's branch line construction and image. Whilst this action is bound to raise some eyebrows amongst SDR supporters it does make a lot of sense. The 2-8-0 would be more at home on a longer line that was not laid as a minor branch line in the first instance. Whilst all the structures on the SDR have now been rebuilt where appropriate the winding nature of the route cannot be altered. The idea of obtaining alternative motive power was recently given a boost when certain more suitable locos were put up for sale. 3803 is in its third year of its current boiler cycle. Tender forms can be obtained from SDRT, The Station, Buckfastleigh, TQ11 0DZ, by e-mailing 3803_Sale@SouthDevonRailway.Org or 'phoning 01364-643536. 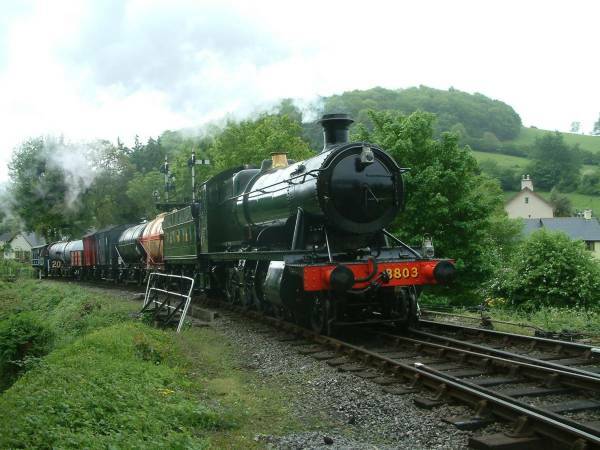 Inspections can be made by appointment at Buckfastleigh - see the for dates when it is rostered to be in service.